You are here: Home / Is It Paleo? / Is Coconut Milk Paleo? Why Is Coconut Milk Paleo? 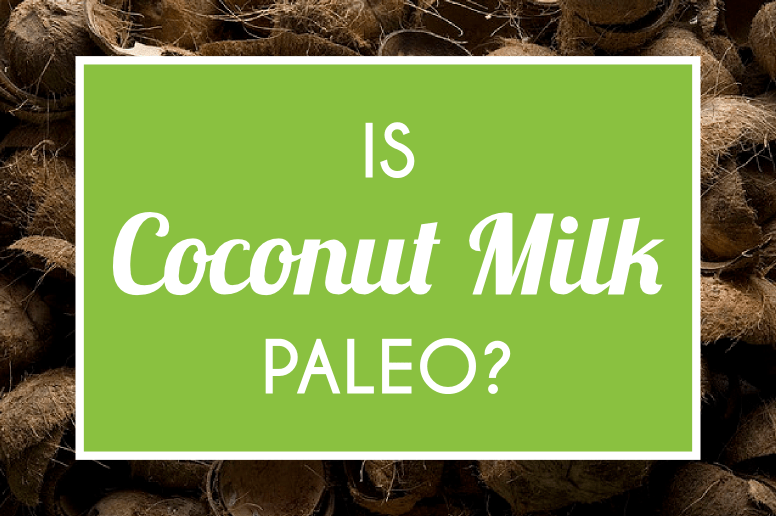 Is All Coconut Milk Paleo? What Does Coconut Milk Contain? So, Is Coconut Milk Paleo? Is Coconut Milk Paleo? Yes. Coconut milk is paleo. Coconut milk is paleo because it is mostly made from two paleo ingredients: coconuts and water. A basic coconut milk recipe will only include these two paleo ingredients, but be cautious because many packaged coconut milks found in stores are full of other not-so-great added ingredients. Fillers, thickeners, and extra flavors are added to almost all store-bought coconut milks to help them keep their texture, avoid the fat in the liquid separating, and stay fresh for longer. Coconut milk is not actually “milk”. It contains no dairy and is made by blending coconut “meat” with water and then straining the resulting meat “pulp” until only water remains. Many people assume that coconut milk is the liquid that is naturally stored inside coconuts, but this is actually coconut water. Coconut water and coconut milk, while similar, are not the same thing. Coconut water is essentially a more natural product, as it pours out of the coconut when the coconut is cut open. It also contains more natural sugar than coconut milk. Both are paleo because they are considered natural, however, coconut water and coconut milk have two different nutritional profiles and are made in different ways. The best kind of coconut milk to drink is that which is made using only straightforward paleo-approved ingredients: coconut (full-fat), water, and maybe a small amount of a natural sweetener such as raw honey or organic stevia. Unfortunately, this is not the type of coconut milk you will easily find in your grocery store. You might not even find it in your local health food store. However, you can avoid consuming the low-quality and pre-packaged coconut milks available in stores by making your coconut milk. Making your own coconut milk is actually a relatively easy process. You can use coconut meat or flakes and blend the coconut with some water, simmer the two together, and then strain the pieces out. This is not a very difficult process, but if you want an even easier option, you can look for a few high quality canned coconut milk products. There are currently a few companies that sell 100% pure canned coconut milk. Two good brands to look out for are Native Forest and Aroy-d. If you are buying canned coconut milk, check the ingredients. The coconut should ideally be organic and the only listed ingredients should be coconut and water. Avoid products that list ingredients such as carrageen, sugar, guar gum, or other chemical-sounding substances. Coconuts are one of the most popular paleo ingredients around. They are extremely nutrient-rich and provide many health benefits. The kind of low-calorie coconut milk that is often sold in cartons will contain far fewer calories and fewer grams of fat than full-fat coconut milk. Branded unsweetened milk usually contains around 40-60 calories per 8 oz, providing minimal carbs, protein, fiber, and sugar. This is because very little coconut is present in the end product, as almost all of it is strained out. Many of the commercial pre-packaged brands of coconut milk lack the nutrients usually found in coconuts and instead contain many unhealthy added ingredients. For this reason, some people feel that only pure, natural coconut milk should be considered paleo and that popular store-bought brands should not. The best kind of coconut milk to consume on the paleo diet is the homemade variety. Canned versions made by trustworthy companies are also fine. These types of coconut milk do not contain added ingredients and are always considered paleo. When you buy coconut milk, you should choose the full-fat variety, as opposed to the “light” versions. Coconuts are naturally high-fat and nutrient-rich, and removing their healthy fats takes away their “whole food” status. Yes, coconut milk is paleo. It’s a good idea to limit the amount of cartoned, processed coconut milk that you buy (for example, coconut milk produced by brands like Blue Diamond and So Delicious). Instead consider either making your own or looking out for the high-quality varieties made by a few select companies. This will ensure that you avoid added ingredients like fillers, unnatural flavors, thickeners, and preservatives.